Chapter 1: Going to my dad’s court sentence. This was a surprise, I didn’t know we were going to this together until this morning. A lot in me was fighting it because I knew it would be boring and honestly didn’t want to spend my time sitting in a court room with my dad. But I was so glad I went and was willing to say “yes” to whatever he wanted me to do. I didn’t know the seriousness of what was happening and the importance of my unconditional support. Some context. I am back and forth about what is appropriate to share, but I’m also wondering what the point of protecting this information is. What stays in the dark has power, so maybe I’ll light it up on a computer screen. We’ll see. This is my family’s mess, but I think it is important to share what is happening so we can be praying for my dad. It is heavy and dark, but at the same time I find myself un-surprised that this is happening because humanity, without Jesus (and most of the time with Him), can be so backwards to the core. Days before my grandmother died, my dad’s little brother and his family emptied her bank account and transferred the rights to all her property without telling any of the other siblings. The amount they stole equaled about $300,000 dollars US cash and close to $1,000,000 dollars in property. Yeah... When my dad confronted his little brother about the matter, his brother filed a restraining order against him and also pressed charges claiming that my dad “robbed them of peace and well-being.” There is clear evidence of my dad’s brother’s behavior, including forged signatures at multiple banks for the withdrawal of my grandmother’s savings. My dad has already been to court in attempts to accuse his brother’s actions, but expects that some bribes may be involved since they have ruled in his brother’s favor despite blaring evidence of what has happened. It's unnerving knowing how much money and power my dad's brother has in this situation. In these matters in Taiwan there is no jury, just a judge, giving a lot of power to single entities without input from citizens. It’s just a big mess. He wanted to go early so he could observe the judge. To see if he got a good or bad apple. Bad apple. We sat in on a couple cases. Honestly I was a little nervous watching all of what was happening. Though I couldn’t understand everything that was being said, I could understand the judge’s behavior and attitudes. The first case we saw, the judge was yelling at an old man because he couldn’t speak loud enough for him to hear. It broke my heart to watch that, and made me nervous for dad. I could tell me dad was getting nervous too. I read Psalm 34 and prayed for my dad and that God would soften the judge and that the truth would be revealed and pursued. I shared some of the Psalm 34 and told him to read it in the courtroom. Time went on, we waited for about two hours. Dad checked the waiting list and saw that he was about 5 names down the list, and each case lasted about 20 minutes. So decided to step out and get some fresh air. This was a really amazing moment for us. We prayed right in front of this eagle. We walked up to this area with this giant wooden eagle sculpture. And my dad said to me, “I think it’s a godsend that you are here. Just by you being here, has helped me through this.” Then he opened up about this whole thing to me and told me that he was so amazed at my faith. He said he wished he could have faith like that. He is frustrated and saddened by his brother. He told me that it was hard for him to believe in the goodness of God when people like his brother and sister-in-law could be so evil. He told me that if his trial went well, it would be a sign that God is there. I believed deep in me that God would bless the trial, that he would make a way for my dad to have a voice and for that voice to be heard. I was so confident and so expectant that God was going to move. Before we went back into the courtroom, I asked my dad if I could pray for him and for the trial, and we bowed our heads right there in front of that magnificent wooden eagle. I began to realize today a little more why my dad can't trust anyone. His own brother framed him. When we left he told me that the only people in the world he had was me, my sister, and my mom. He is an orphan. I really believed that God was going to move on the judge and the trial and allow the truth to be heard, but when we went back downstairs, we had missed his slot by one hearing which was so mysterious to me because when we left there were at least 6 people in front of him. They reassigned his time for another day. This is all so mysterious. But maybe, God was protecting him so that he could get a better judge next time. Or maybe the purpose of all of this was so that we could lift up prayers in front of that eagle. Maybe it was so that I could see all the layers beneath my dad's pain and help me to understand why he is the way he is. When we left, my dad kept saying, "there must be some kind of design in all of this." Yes, yes there is. 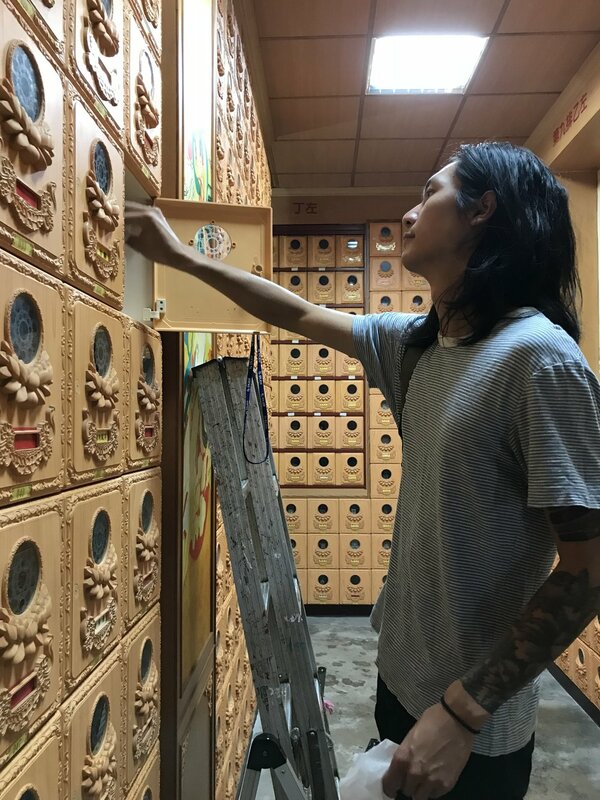 Chapter 2: Visiting Grandma's Grave: Yesterday morning, we left the city on bike and rode to the temple where my grandmother's ashes are kept. Wr payed our respects, cleaned her resting place, and spent some time in this beautiful field right outside of the temple. This is best told in the pictures. Chapter 3: Who Is My Father? This part is a little heavy. You've been warned. I must let the truth of the situation speak, good bad and ugly truth. I need to preface all of this by saying that it is imperative to separate the deeds of a broken man from the man himself. These are the actions of my father, but they are all spewing from deep, unresolved brokenness. I write these things not to illicit pity for me, or incite anger towards this man. I write it so that we might find some freedom in facing the truth of my life. I won't take any "I'm sorry's," but maybe a couple "Praying for you, you are not alone's." All my life my dad has cut me down. When it comes to music, he has always found ways to make sure I knew I wasn't good enough at it. When I was nineteen I started posting videos on youtube of me covering some songs and he would comment on them and criticize things about my performance. It tore me apart. That's why I am scared to do youtube videos. I am coming to understand that he doesn't do it to hurt me, it's just that he has a plan for my life and it doesn't look like what I'm doing. He doesn't know how to deal with that reality, it is out of his control, so he tries to control me through discouraging me. In his mind, I might come to my senses and get a real job. His whole upbringing was struggling to make it, so he cannot understand a perspective that isn't about making money. Yesterday, he took me to see a band and meet up with his college friend in Taipei. At dinner he told me that my last album didn't impress him and that he thought the songs were weak. He said they didn't move him and that they needed more dynamics. As the one who wrote the songs, engineered and produced the record, it broke me. We worked relentlessly on making that record. This comment burned deep inside me. I felt like there was an open wound in my heard and my dad stuck his finger all the way in there. We stayed at the show and my dad got a little drunk. We end up missing the last train back to home, which is 2 hours away. We are sitting in the train station now. My dad refuses to pay for a cab and tells me we're going to spend the night at the train station. It's 11:30pm, the next train comes at 5:30am. There's something in him, that I have inherited, that needs to pay in full for all his mistakes. In his mind, it was his fault we missed the train so we had to punish ourselves by being homeless for the night. His pride won't allow him to be loved. At this point I'm fuming because he will not listen to reason. I offered to even pay for the cab, to no avail. He began to take off his socks and shoes to fortify his decision. And for some reason, at this point. Everything in me broke and I lost it. I mean, I went insane. It felt like years of anger, frustration, confusion came spewing out of me. 24 years of never being known or sought, of being treated like I was stupid, of not being heard. I would be heard now. I wanted to give justice to every comment he ever said to me to put me down. I wanted to pay him back for how his pride and his anger and robbed my family. For that one time when I was sixteen and he came into my room and punched me in the face. For every time I heard my mama cry. For feeling like I never had a safe home. He stuck his finger into the biggest wound of my soul. Everything went red. I felt like a nine-year old kid, on the playground, and the playground bully pushed me one too many times. I grabbed him by the collar and threw him to the ground. Standing over him in the fluorescent light of the station, my face pressed against his, I released everything. I am yelling at the top of my lungs, "I don't understand why it is like this! I don't understand why you are like this!" I was afraid of myself in that moment. I didn't want to hurt him, I just wanted to be heard. I felt like I had tried everything I knew how except force. My desperate measure: You. will. hear. me. It felt like I was a cornered and this was my only way out. I wanted him to feel the hurt that was inside me. I wanted him to hear me. He gave me the keys to the house and told me to leave and do whatever I wanted, but that he was staying in the train station. Before I left he said this to me, "If I had succeeded as a father, I would not have raised someone like you." Those words follow me . I am frozen in the cab, fighting back tears. I was afraid and alone, confused and hurt. I should not have let this situation push me to that point. I should not have touched him. I also thought I had undone all the good that was done in the last two days. I wondered if I destroyed any chance of God moving in this situation. I also wonder how my own dad could look at me and say those words to me. Honestly, I felt like, in this moment, hope had left our relationship. It's 1:30 when I get back. I am a lunatic in the park, pacing back and forth and crying on the phone. I reach out to my home bases. Mom, Kerby, and Michael and Ivey who know and love me the best of anyone. They prayed for me, encouraged me, and helped me to understand the whole situation. They helped me hope again. I will not let this situation stop what God has in store. I apologized to my father this morning for my actions last night, owning my side of the street. He took my apology and threw it right back in my face. God, we need some second chances here today. Today I am feeling tired and discouraged. The depth of my father's brokenness and irrationality is continuing to be revealed. I feel like I am trying to move an immovable object. I am facing a giant. And as pain is being revealed in my dad's heart, I am seeing the same pain within my own life. I am being brought to the end of what I can manage and what I can understand. I am in a foreign place with a man I cannot trust or believe. I am alone. I am in the belly of the beast. But in the depths of my soul I am crying out to God to come and minister, to pour out His grace and peace. I don't really know what else to pray right now. I prayed for this trip for so long, for salvation, for life change, and it's so hard for me to believe right now. My prayer is now, God, show me the point of all this. Help me believe. Father me. Tell me the truth. I am pressured to assure you guys that despite all this I am doing fine. But let's leave the masks in the jail. Masks free no one. The truth is, I am not doing fine. This hurts like hell, to face all this. I am confused and unsure in what to do now. There is a lot of tension. But you know what is so amazing about this after all? The even here, the Holy Spirit dwells in me. I can feel Him whispering to my heart. He is the eye in the storm. In a moment of great disappointment, which way will we go? In the presence of failure, what will we choose? When we feel defeated, will we let God raise us up? Who is the father? Who is my father? This man that raised me, who has made sure all my life I knew I didn't have what it takes. He is just a man. A broken and lost child whose body resembles an adult human being. But He is just a man, a dad, and he might be trying the best he can. But my real, heavenly father loves me. He knows the depths of my heart, my desires and my hurts. He was there at the train station yesterday. He catches all those words and corrects them. He protects my heart. He leads me through the night with a pinlight in the distance. This is His hope. He makes a promise an follows through on it no matter the cost. My father loves my music, my heart, and the person I am becoming each day. He forgets the ways I have sinned against Him and His people. He is very proud. Let me walk in this and this alone. Thank you guys for the prayers. We continue to climb.